Since the Astronomical Telescope for Educational Outreach (ATEO-1) went online back in May 2017, we have since had the chance to image galaxies and galaxy clusters with a 16" f/3.7 astrograph telescope. Besides using the remote robotic telescope for acquiring "pretty" pictures of deep-sky objects such as galaxies, it can also be used as a tool for gathering data for extragalactic supernovae search. Professional astronomers distinguish between two main classes of supernovae. The distinctions have to do with the type of explosion occurring, how it is triggered, the resulting light curve and the atomic elements visible in the spectrum of the supernova. However, for amateur astronomers’ purposes, we can consider two very basic types of a supernova: galactic and extragalactic. Our primary concern is with extragalactic supernovae, as a galactic supernova is far more infrequent an event than even a brilliant comet, solar eclipse, or any of a number of other “rare” astronomical phenomena. In fact, more than a dozen generations have passed without any human witnessing a supernova in our own Milky Way galaxy! Imaging supernovae involve imaging galaxies as mentioned above. There are few other considerations than those normally applied to capturing a CCD image of a distant galaxy. Supernovae usually occupy the briefest time span of the three main transient events discussed in this section. Comets are often visible for weeks or even months, and even rapidly-moving near-Earth asteroids stick around for a week or more. Supernovae, on the other hand, may last only a few nights, appearing as a single brilliant star outshining the light of 100 billion companions in its host galaxy. There is a list published online by the Central Bureau for Astronomical Telegrams that gives the latest discoveries and the name of the host galaxy (or position if the host galaxy is uncataloged). Due to the short time available to image supernovae, subscribing to the IAU Circular is recommended as well. This email circular lists recent astronomical headlines including supernovae, novae, comets, interesting asteroids, and other events. Often the information in the circular is not available immediately through any other source. Photometric (brightness) measurements can be made of a supernova as it fades. This information tells scientists about the type of explosion and can even lead to information about the distance to the host galaxy or the redshift (recessional velocity) of that galaxy, leading to a better understanding of the universe. 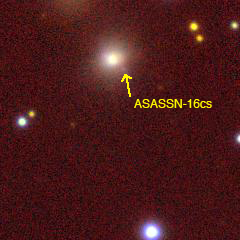 ASASSN-16cs Extragalactic Supernova Confirmation (Right) - Image by Isaac Cruz. One of our neighbors at SkyPi Remote Observatory, Isaac Cruz, discovered an extragalactic supernova on March 7, 2016. This one was in the constellation of Gemini (The Twins). Isaac received a notification of a transient from the ASASSN system from Ohio State University. Isaac stated, "Luckily I've been given the opportunity to do remote observing from the great folks at SkyPi Remote Observatory in New Mexico so this was the perfect time to do it." Isaac connected to his remote system and pointed the telescope to the given coordinates. He took a 10-second image at 1/3 the resolution (Bin 3) and the supernova was obvious just south of the galaxy. Discovery! Isaac then took a 10-minute image at full resolution and sent it for verification. In a few minutes, he received the confirmation that the new star had been certified and designated ASASSN-16cs and SN 2016asf. Now that our hosting neighbor at SkyPi Remote Observatory has proven this type of discovery is possible with remote robotic telescopes, it has inspired us to craft an extragalactic supernova search program of our own that would allow students and individual users of the ATEO network to participate in such an endeavor.